For 1969–70, the Chicago Black Hawks claimed Tony Esposito from Montreal on waivers. Esposito had a spectacular season with Chicago, posting a 2.17 GAA and setting a modern day NHL record with fifteen shutouts, for which he won the Calder Trophy as the league's best rookie. He also took the Vezina Trophy and was named to the First All-Star team at season's end. He also was runner-up for league MVP (Hart Trophy). It was during this record setting season he earned the nickname Tony 'O'. 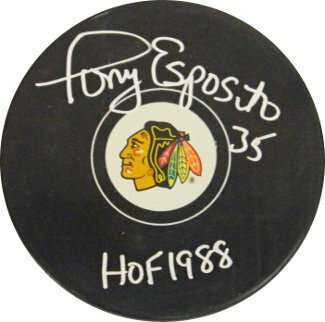 Tony Esposito hand autographed Chicago Blackhawks Puck with HOF 1988 inscription. Schwartz Sports Hologram and Certificate of Authenticity from Athlon Sports.